EzPE3 is designed to be a small and straightforward project to build a WinPE3 from Windows 7 install media with as little configuration as possible. EzPE3 builds a x86/x64 WinPE with explorer and network activated. No additional services or features have been included. Drivers can be added with the included Add Drivers script. Not all api functions have been included in the common_api script. If your app script needs any additional api functions to be implemented then let me know and I will add it next. I went to try out the project, however on my side the project construction gets stuck on the part "mounting install.wim". The next step was moving the project inside my virtual machine where I can test winbuilder projects from a clean windows installation. I've rebooted the virtual machine from scratch to ensure no interference from previous builds of other projects would occur but the results were the same. I guess mounting WIMs is the toughest cookie here. On a plus note, I've moved your account to the group of official .script developers. This is a well deserved distinction, congratulations! Well that's disappointing for a project that is supposed to be easy to build. What is your source media? x86/x64? Is it Sp1? What about your host OS? On my machine it takes dism almost 3 minutes to mount both wims. I don't see anything at http://temp.reboot.pro/. I'm using an x86 Windows 7 Enterprise en-US 6.1.7600.16385 SP0 as source and this same source was also used as host for the virtual machine environment. I've reuploaded the file, all contents there get deleted after some hours but it doesn't provide much info. No error is there. You say DISM takes 3 minutes to mount the WIMs? This might be the case then, I was just impatient. On my log I see that two minutes were waited before I aborted the build thinking it was irresponsive. Perhaps it would be good to add a notice saying something like "Loading the WIM archives, this operation might take some minutes. Please wait.." to inform users about this waiting period. Will later retry and wait longer. Great suggestion, I will add that information to the script. Hi my friend, tried again and waited for a good while but in the end an error was output. Before this build I restarted the OS and used a fresh copy of the project on a new folder. Do you have any idea of what can be going wrong? Depending on the source CD the red strings are different. As Nuno said, he uses SP0. The last string should be replaced by WildCard *. Tested with Win 7 32-bit SP1 ISO mounted with Virtual CloneDrive - I have Win7 WAIK already installed. Using Win 7 64-bit system it built OK and booted using grub4dos mapped as an ISO file from USB. Ok, I edited the Copy Extra Files script to handle Sp0 discs. Thank you all for the input. Tested. Looks simple and easy to follow. Build gave 1 Error. Was testing v1 will test with v2. yeah, thats the same problem that nuno had with a sp0 disc. Should be fixed now. Thanks for testing. Version 2 works as you expect. Thanks! Build ISO. Booted. Got an error. Then after those messages a reboot. Hmm, that I am unable to reproduce. The target path is set in the Create Build Environment script. Can you provide a log file? Ok, I was able to reproduce the problem by replicating your directory structure. It could be that dism doesn't like those folder names. It's almost 2am here though so I will try to find out why tomorrow. Post 165 talks about fixing spaces in build. Found also that is is hard to delete the temp and the Target folder. Something about not having the right permissions to delete files in the folder. 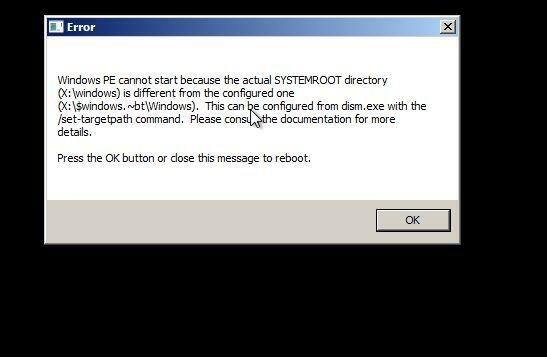 This is in Windows 7. Yeah, it was just some missing quotes in a couple of places. Wims were not unmounting due to the same problem with missing quotes so the temp folder could not be deleted. Fixed and uploaded version 3. This Windows 7 was both the source and building host from a virtual machine. I guess that not having spaces on the folder names helped to avoid what TheHive described. Took some 30 minutes to complete the build and resulted on a 200Mb ISO on my side. It was really fast to boot. The design is following the Windows standard, I like that quite a lot. 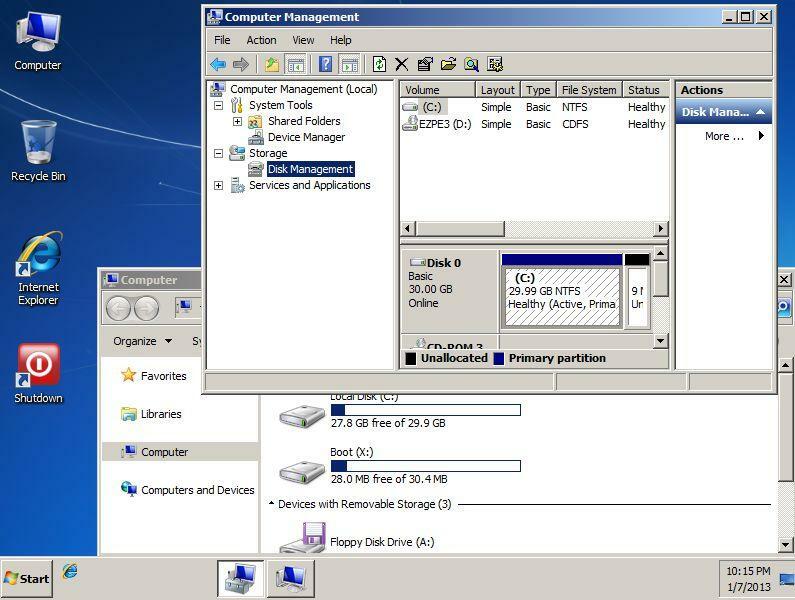 I've tested MMC, the Disk Management tab is active and for me this is great. Internet Explorer is also active as mentioned, just had the annoying start screen on the first run that would be nice to disable. Thanks for the feedback. Spaces in the directory structure should be just fine now with version 3 that I just uploaded. Did it really take 30 minutes to build? It usually takes less than 10 for me. Another goal for this project is to have little or no post processing at boot. That means no loader is run and things like shortcut generation are done at build time. Driver detection is done in the background at boot. This can also make the mouse and keyboard a bit intermittently non responsive for the first few seconds. But this definitely makes booting much faster. I'll have to get the registry settings that will prevent the first run window in internet explorer. Don't worry about the 30 minutes. I was running from inside a virtual machine and there is of course a processing penalty on this kind of things. I fully subscribe your concerns about keeping the project neat, fast and simple. btw: You're featured on this week's reboot newsletter. v3 seems to be building and working. Is the project compatible with the scripts on the Download portal. Edited by neofita, 08 January 2013 - 01:49 PM. I tried on my system with a German Win7 Enterprise SP0 source. Host is XP SP3 x86. Dism just does nothing (or is not installed?). The Mount Wims Script is done within half a second. %ExitCode% of ShellExecute Dism is 87. BTW2: Inspite I did not build something runnable right now, a look through the scripts tells me that it can become an excellent project! It should be compatible with most. I have not implemented all api functions though. Most app scripts don't need more than unpack and add_shortcut so those will work. I will try some test builds to try and replicate some of the problems some of you have had. Thanks for the tip psc, I will start logging exit codes as well. That will make debugging much easier.